Here, multimillion degree gas is seen in X-rays from Chandra (blue). Credit: X-ray: NASA/CXC/Rutgers/J.Hughes; Optical: NASA/STScI. A star that suddenly increases greatly in brightness because of a catastrophic explosion that ejects most of its mass may be a supernova. From the burst until it fades after some weeks or months a supernova can radiate as much energy as the Sun is expected to emit over its entire life span. The explosion expels most or all of a star's material at a velocity of up to 30000 km/s (10% of light speed, powering a shock wave into the interstellar medium. The stream lines on this computer simulation of a supernova show the flow of matter behind the shock wave giving clues as to the origin of pulsars. Credit: Blondin and Mezzacappa. Def. a "star which explodes, increasing its brightness to typically a billion times that of our sun, though attenuated by the great distance from our sun" is called a supernova. Analytical models such as polytropes to approximate the behaviors of a star and computational numerical simulations give insight into the heart of what is going on or can reveal the existence of phenomena and effects that would otherwise not be seen. At right is a computer simulation of a supernova explosion. "Our primary scientific and computational focus is on tera- to exa-scale simulation of supernovae of both classes in the Universe." "The stream lines in this image [at right] show the two counter rotating flows that may be established below the supernova shock wave (the surface in the image) by the instability of the shock in a core collapse supernova explosion. The innermost flow accretes onto the central object, known as the proto-neutron star, spinning it up. This may be the mechanism whereby pulsars (spinning neutron stars) are born." "[T]he core collapse supernova shock wave is likely reenergized to initiate an explosion at much later times than previously anticipated. The shock wave must exit the iron core and enter the oxygen layer before shock revival can occur. In the oxygen layer, the density of the star drops off dramatically, which gives the shock less to plow through. In addition, in the oxygen layer, nuclear burning can occur, aiding the shock energetically. The delay to explosion is naturally set by the time it takes for the shock to reach the oxygen layer. The previously discovered stationary accretion shock instability (SASI) causes large-scale distortions of the shock, causing it to reach the oxygen layer sooner in certain directions, thereby precipitating the onset of explosion. In this new picture, we have obtained explosions over a range of stellar progenitors, between 10 and 20 Solar masses." "Stars from about 8 to about 15 Mʘ explode as supernovae, but do not have a strong stellar wind, and so explode into the interstellar medium". New data from NASA's Chandra X-ray Observatory has provided stringent constraints on the environment around one of the closest supernovas discovered in decades. Credit: Raffaella Margutti, Jerod Parrent, Atish Kamble, Alicia Soderberg, Ryan Foley, Dan Milisavljevic, Maria Drout, and Robert Kirshner. On 21 January 2014, astronomers at the University of London Observatory in London, UK, pointed their telescope at the galaxy and spied an intensely bright spot that suddenly appeared within the galaxy. Credit: NASA, ESA, A. Goobar (Stockholm University), and Hubble Heritage Team STScI/AURA), J. Gallagher (University of Wisconsin), M. Mountain (STScI) and P. Puxley (NSF). "On January 21, 2014, astronomers witnessed a supernova soon after it exploded in the Messier 82, or M82, galaxy. Telescopes across the globe and in space turned their attention to study this newly exploded star, including Chandra [22 pointings from 20 September to 03 February 1999 - 2014]. Astronomers determined that this supernova, dubbed SN 2014J, belongs to a class of explosions called "Type Ia" supernovas. These supernovas are used as cosmic distance-markers and played a key role in the discovery of the Universe's accelerated expansion, which has been attributed to the effects of dark energy. Scientists think that all Type Ia supernovas involve the detonation of a white dwarf. One important question is whether the fuse on the explosion is lit when the white dwarf pulls too much material from a companion star like the Sun, or when two white dwarf stars merge. This image contains Chandra data, where low, medium, and high-energy X- rays are red, green, and blue respectively [Red (0.5-1.2 keV); Green (1.2-2.0 keV); Blue (2.0-7.0 kev)]. The boxes in the bottom of the image show close-up views of the region around the supernova in data taken prior to the explosion (left), as well as data gathered on February 3, 2014, after the supernova went off (right). The lack of X-rays detected by Chandra is an important clue for astronomers looking for the exact mechanism of how this star exploded." "The non-detection of X-rays reveals that the region around the site of the supernova explosion is relatively devoid of material. Astronomers expect that if a white dwarf exploded because it had been steadily collecting matter from a companion star prior to exploding, the mass transfer process would not be 100% efficient, and the white dwarf would be immersed in a cloud of gas. If a significant amount of material were surrounding the doomed star, the blast wave generated by the supernova would have struck it by the time of the Chandra observation, producing a bright X-ray source. Since they do not detect any X-rays, the researchers determined that the region around SN 2014J is exceptionally clean." "A viable candidate for the cause of SN 2014J must explain the relatively gas-free environment around the star prior to the explosion. One possibility is the merger of two white dwarf stars, in which case there might have been little mass transfer and pollution of the environment before the explosion. Another is that several smaller eruptions on the surface of the white dwarf cleared the region prior to the supernova. Further observations a few hundred days after the explosion could shed light on the amount of gas in a larger volume, and help decide between these and other scenarios." "Spiral galaxy Messier 82 [on the left, North is 50.1° left of vertical] has long been known for its remarkable starburst activity, caused by interactions with its near neighbour Messier 81, and has been the subject of intense study for many years. On 21 January 2014, astronomers at the University of London Observatory in London, UK, pointed their telescope at the galaxy and spied [at (J2000) RA 09h 55m 50.70s | Dec +69° 40' 37.00" in Ursa Major] an intensely bright spot [that] seemed to have suddenly appeared within the galaxy [...]." "This bright spot is actually a new supernova known as SN 2014J — the closest supernova to Earth in recent decades! Since its discovery, SN 2014J has been confirmed as a type Ia supernova, making it the closest of its type to Earth in over 40 years (since SN 1972E) [...]. This new NASA/ESA Hubble Space Telescope image is set against a previous mosaic of Messier 82 from 2006 (heic0604a), and shows the supernova as an intensely bright spot towards the bottom right of the frame." Mug Shots of Supernovas Reveal Two Key Findings Credit: NASA/Swift/Immler. "Supernova 2006bp [just on the left above center] quickly fades in X-rays. NASA's Swift satellite captured this supernova in X-rays in less than a day after the explosion, a speed record. In just over a week, the X-rays were gone. Typically X-ray telescopes don't observe supernova until over a week after the explosion, which is why until now no one has seen such early emission of X-rays." Supernova 2005ke, which was detected in 2005, is a Type Ia supernova, an important "standard candle" explosion used by astronomers to measure distances in the universe. Shown here is the explosion in optical, ultraviolet and X-ray wavelengths. This is the first X-ray image of a Type Ia, and it has provided observational evidence that Type Ia are the explosion of a white dwarf orbiting a red giant star. Credit: NASA/Swift/S. Immler. A Type Ia supernova is an explosion of a white dwarf in orbit around either another white dwarf or a red giant star. The dense white dwarf can accumulate gas donated from the companion. When the dwarf reaches the critical mass of 1.4 M⊙, a thermonuclear explosion ensues. As each Type Ia shines with a known luminosity, Type Ia are called "standard candles" and are used by astronomers to measure distances in the universe. Supernova SN 1987A is one of the brightest stellar explosions since the invention of the telescope more than 400 years ago. Credit: ESA/Hubble & NASA. X-ray data from Chandra (blue) is combined with optical data from the Hubble Space Telescope (appearing orange and red) in this image. Credit: X-ray: NASA/CXC/PUS/E.Helder et al; Optical: NASA/STScI. February 24, 2007 marks the 20th anniversary of one of the most spectacular events observed by astronomers in modern times, Supernova 1987A. Credit: X-ray: NASA/CXC/PSU/S.Park & D.Burrows. ; Optical: NASA/STScI/CfA/P.Challis. Recent Chandra observations have revealed new details about the fiery ring surrounding the stellar explosion that produced Supernova 1987A. Credit: X-ray: NASA/CXC/PSU/S.Park & D.Burrows. ; Optical: NASA/STScI/CfA/P.Challis. "On February 23.316 UT, 1987, [blue] light and neutrinos from the brightest supernova in 383 years arrived at Earth ... it has been observed ... at all wavelengths from radio through gamma rays, SN 1987A is the only object besides the Sun to have been detected in neutrinos." At left is an image of supernova SN 1987A, one of the brightest stellar explosions since the invention of the telescope more than 400 years ago. Four days after the event was recorded, the progenitor star was tentatively identified as Sanduleak -69° 202, a blue supergiant. This was an unexpected identification, because at the time a blue supergiant was not considered a possibility for a supernova event in existing models of high mass stellar evolution. Many models of the progenitor have attributed the color to its chemical composition, particularly the low levels of heavy elements, among other factors. On June 19, 1988, from Birigüi (50° 20' W 21° 20' S) at 10:15 UTC a balloon launch occurred which carried two NaI(Tl) detectors (600 cm2 total area) to an air pressure altitude of 5.5 mb for a total observation time of 6 hr. The supernova SN1987A in the Large Magellanic Cloud (LMC) was discovered on February 23, 1987, and its progenitor is a blue supergiant (Sk -69 202) with luminosity of 2-5 x 1038 erg/s. The 847 keV and 1238 keV gamma-ray lines from 56Co decay have been detected. The water-based detectors Kamiokande II and IMB detected 11 and 8 antineutrinos of thermal origin, respectively, while the scintillator-based Baksan detector found 5 neutrinos (lepton number = 1) of either thermal or electron-capture origin, in a burst lasting less than 13 seconds. "First seen in 1987, this supernova (dubbed SN 1987A) was the brightest supernova and nearest one to Earth in the last century. In a supernova explosion, a massive star runs out of fuel then collapses onto their core, flinging the outer layers of the star into space. By combining X-ray data from Chandra (blue) with optical data from the Hubble Space Telescope (appearing orange and red) [in the image on the right], astronomers can observe the evolution of the expanding shell of hot gas generated by the explosion and watch as a shock wave from the blast heats gas that once surrounded the doomed star. The two bright stars near SN 1987A are not associated with the supernova [4 pointings between January and January 2008 - 2009]." "February 24, 2007 marks the 20th anniversary of one of the most spectacular events observed by astronomers in modern times, Supernova 1987A. The destruction of a massive star in the Large Magellanic Cloud, a nearby galaxy, spawned detailed observations by many different telescopes, including NASA's Chandra X-ray Observatory and Hubble Space Telescope. The outburst was visible to the naked eye, and is the brightest known supernova in almost 400 years." "This composite image [second down on the right] shows the effects of a powerful shock wave moving away from the explosion. Bright spots of X-ray and optical emission arise where the shock collides with structures in the surrounding gas. These structures were carved out by the wind from the destroyed star. Hot-spots in the Hubble image (pink-white) now encircle Supernova 1987A like a necklace of incandescent diamonds. The Chandra data (blue-purple) reveals multimillion-degree gas at the location of the optical hot-spots. These data give valuable insight into the behavior of the doomed star in the years before it exploded." "The Chandra X-ray image (left) reveals a ring of multimillion-degree gas produced by the collision of an outward-moving supernova shock wave with a ring of cool circumstellar gas. The optical image (right) from the Hubble Space Telescope shows a ring of bright spots that are also caused by the shock wave hitting the cool gas. Long before the explosion of the massive star that produced Supernova 1987A, most of its outer layers expanded away in a slowly moving stellar wind that formed a vast cloud of gas. Later, a high-speed wind from the star carved out a cavity about 1 light year in diameter in the cool gas cloud. As the supernova shock wave plows deeper into the cool cloud the ring should become larger and much brighter in both optical and X-ray light." "The supernova occurred in the Large Magellanic Cloud, a galaxy only 160,000 light years from Earth. The outburst was visible to the naked eye, and is the brightest known supernova in almost 400 years. The site of the explosion was traced to the location of a blue supergiant star called Sanduleak -69º 202 (SK -69 for short) that had a mass estimated at approximately 20 Suns." "Subsequent optical, ultraviolet and X-ray observations have enabled astronomers to piece together the following scenario for SK -69: about ten million years ago the star formed out of a dark, dense, cloud of dust and gas; roughly a million years ago, the star lost most of its outer layers in a slowly moving stellar wind that formed a vast cloud of gas around it; before the star exploded, a high-speed wind blowing off its hot surface carved out a cavity in the cool gas cloud." "The intense flash of ultraviolet light from the supernova illuminated the edge of this cavity to produce the bright ring seen by the Hubble Space Telescope. In the meantime the supernova explosion sent a shock wave rumbling through the cavity." "X-ray spectra obtained with Chandra provide evidence that the optical hot-spots and the X-ray producing gas are due to a collision of the outward-moving supernova shock wave with dense fingers of cool gas protruding inward from the circumstellar ring [...]. These fingers were produced long ago by the interaction of the high-speed wind with the dense circumstellar cloud." "The dense fingers and the visible circumstellar ring represent only the inner edge of a much greater, unknown amount of matter ejected long ago by SK -69. As the shock wave moves into the dense cloud, ultraviolet and X-radiation from the shock wave will heat much more of the circumstellar gas." Using Chandra, astronomers have detected X-rays from the remains of a supernova that was spotted from Earth over 50 years ago. Credit: X-ray: NASA/CXC/STScI/K.Long et al., Optical: NASA/STScI. "Named SN 1957D because it was the fourth supernova to be discovered in the year of 1957, it is one of only a few located outside of the Milky Way galaxy [galaxy NGC 5236 in Hydra at 15 million light years, RA 13h 37m 00.80s | Dec -29 51 58.60] that is detectable, in both radio and optical wavelengths, decades after its explosion was observed. In 1981, astronomers saw the remnant of the exploded star in radio waves, and then in 1987 they detected the remnant at optical wavelengths, years after the light from the explosion itself became undetectable." "A relatively short observation -- about 14 hours long -- from NASA's Chandra X-ray Observatory in 2000 and 2001 did not detect any X-rays from the remnant of SN 1957D. However, a much longer observation obtained in 2010 and 2011, totaling nearly 8 and 1/2 days of Chandra time, did reveal the presence of X-ray emission. The X-ray brightness in 2000 and 2001 was about the same as or lower than in this deep image [12 pointings between 29 April and 28 December 2000 - 2011]." "This new Chandra image of M83 is one of the deepest X-ray observations ever made of a spiral galaxy beyond our own. This full-field view of the spiral galaxy shows the low, medium, and high-energy X-rays observed by Chandra in red, green, and blue respectively. The location of SN 1957D, which is found on the inner edge of the spiral arm just above the galaxy's center, is outlined in the box (or can be seen by mousing over the image.)" "The new X-ray data from the remnant of SN 1957D provide important information about the nature of this explosion that astronomers think happened when a massive star ran out of fuel and collapsed. The distribution of X-rays with energy suggests that SN 1957D contains a neutron star, a rapidly spinning, dense star formed when the core of pre-supernova star collapsed. This neutron star, or pulsar, may be producing a cocoon of charged particles moving at close to the speed of light known as a pulsar wind nebula." "An image from the Hubble Space Telescope (in the box labeled "Optical Close-Up") shows that the debris of the explosion that created SN 1957D is located at the edge of a star cluster less than 10 million years old. Many of these stars are estimated to have masses about 17 times that of the Sun. This is just the right mass for a star's evolution to result in a core-collapse supernova as is thought to be the case in SN 1957D." This is a false color image of Cassiopeia A composited of data from three sources. Red is infrared data from the Spitzer Space Telescope, orange is visible data from the Hubble Space Telescope, and blue and green are data from the Chandra X-ray Observatory. The cyan dot just off-center is the remnant of the star's core. Credit: NASA/JPL-Caltech. These are a pair of images of Supernova remnant Cassiopeia A. Credit: NASA/CXC/GSFC/U.Hwang et al. Regarding Cassiopea A supernova remnant, it is believed that first light from the stellar explosion reached Earth approximately 300 years ago but there are no historical records of any sightings of the progenitor supernova, probably due to interstellar dust absorbing optical wavelength radiation before it reached Earth (although it is possible that it was recorded as a sixth magnitude star 3 Cassiopeiae by John Flamsteed on August 16, 1680). Possible explanations lean toward the idea that the source star was unusually massive and had previously ejected much of its outer layers. These outer layers would have cloaked the star and reabsorbed much of the light released as the inner star collapsed. In 1999, the Chandra X-Ray Observatory found a "hot point-like source" close to the center of the nebula that is quite likely the neutron star or black hole predicted but not previously found. "This spectacular image [at left] of the supernova remnant Cassiopeia A is the most detailed image ever made of the remains of an exploded star. The one-million-second image shows a bright outer ring (green) ten light years in diameter that marks the location of a shock wave generated by the supernova explosion. A large jet-like structure that protrudes beyond the shock wave can be seen in the upper left. In the accompanying image, specially processed to highlight silicon ions, a counter-jet can be seen on the lower right." "Surprisingly, the X-ray spectra show that the jet and counter-jet are rich in silicon atoms and relatively poor in iron atoms. This indicates that the jets formed soon after the initial explosion of the star; otherwise, the jets should have contained large quantities of iron from the star's central regions." "The bright blue fingers located near the shock wave on the lower left are composed almost purely of iron gas. This iron was produced in the central, hottest regions of the star and somehow ejected in a direction almost perpendicular to the jets." "The bright source at the center of the image is presumed to be a neutron star created during the supernova. Unlike the rapidly rotating neutron stars in the Crab Nebula and Vela supernova remnants that are surrounded by dynamic magnetized clouds of electrons called pulsar wind nebulas, this neutron star is quiet, faint, and so far shows no evidence for pulsed radiation." "A working hypothesis is that the explosion that created Cassiopeia A produced high-speed jets similar to but less energetic than the hypernova jets thought to produce gamma-ray bursts. During the explosion, the neutron star may have developed an extremely strong magnetic field that helped to accelerate the jets. This strong magnetic field later stifled any pulsar wind activity, so the neutron star today resembles other strong-field neutron stars (a.k.a. "magnetars") in lacking a pulsar wind nebula." Ths s an X-ray, optical & infrared composite of Kepler's Supernova Remnant. Credit: NASA/ESA/JHU/R.Sankrit & W.Blair. Blue: X-ray (4-6 keV), Chandra X-ray Observatory, The higher-energy X-rays come primarily from the regions directly behind the shock front. Green: X-ray (0.3-1.4 keV), Chandra X-ray Observatory; Lower-energy X-rays mark the location of the hot remains of the exploded star. Yellow: Optical, Hubble Space Telescope; The optical image reveals 10,000 degrees Celsius gas where the supernova shock wave is slamming into the densest regions of surrounding gas. Red: Infrared, Spitzer space telescope; The infrared image highlights microscopic dust particles swept up and heated by the supernova shock wave. X-ray image of the SN 1572 Type Ia supernova remnant as seen by Chandra Space Telescope. Credit: NASA/CXC/Rutgers/J.Warren & J.Hughes et al. "In 1572, the Danish astronomer Tycho Brahe observed and studied the explosion of a star [in Cassiopeia, at about 13,000 light years, RA 00h 25m 17s | Dec +64° 08' 37] that became known as Tycho's supernova. More than four centuries later, Chandra's image of the supernova remnant shows an expanding bubble of multimillion degree debris (green and red) inside a more rapidly moving shell of extremely high energy electrons (filamentary blue) [Red 0.95-1.26 keV, Green 1.63-2.26 keV, Blue 4.1-6.1 keV]." "The supersonic expansion (about six million miles per hour) of the stellar debris has created two X-ray emitting shock waves - one moving outward into the interstellar gas, and another moving back into the debris. These shock waves produce sudden, large changes in pressure and temperature, like an extreme version of sonic booms produced by the supersonic motion of airplanes." The "stellar debris has kept pace with the outer shock and is only about half a light year behind." A "large fraction of the energy of the outward-moving shock wave is going into the acceleration of atomic nuclei to speeds approaching the speed of light. The Chandra observations provide the strongest evidence yet that nuclei are indeed accelerated and that the energy contained in the high-speed nuclei in Tycho's remnant is about 100 times that observed in high-speed electrons." "Since their discovery in the early years of the 20th century, many sources of cosmic rays have been proposed, including flares on the sun and similar events on other stars, pulsars, black hole accretion disks, and the prime suspect - supernova shock waves. Chandra's observations of Tycho's supernova remnant strengthen the case for this explanation. The remnant, called W49B, is about a thousand years old, as seen from Earth, and is at a distance of about 26,000 light years away. Credit: X-ray: NASA/CXC/MIT/L.Lopez et al. ; Infrared: Palomar; Radio: NSF/NRAO/VLA. "Instead of radiating out symmetrically, W49B's exploding star shot more material out from its poles versus from its equator." "The image combines X-rays from NASA's Chandra X-ray Observatory in blue and green, radio data from the NSF's Very Large Array in pink [magenta], and infrared data from Caltech's Palomar Observatory in yellow." In "the W49B supernova [at RA 19h 11m 07s | Dec +09° 06' 00" in Aquila], material near the poles of the doomed rotating star was ejected at a much higher speed than material emanating from its equator. Jets shooting away from the star's poles mainly shaped the supernova explosion and its aftermath." Iron occurs "in only half of the remnant while other elements such as sulfur and silicon were spread throughout. This matches predictions for an asymmetric explosion. Also, W49B is much more barrel-shaped than most other remnants in X-rays and several other wavelengths, pointing to an unusual demise for this star." The combined image from the Chandra and XMM-Newton X-ray observatories of RCW 86 shows the expanding ring of debris that was created after a massive star in the Milky Way collapsed onto itself and exploded. Credit: Chandra: NASA/CXC/Univ. of Utrecht/J.Vink et al. XMM-Newton: ESA/Univ. of Utrecht/J.Vink et al. On the right is a "combined image from the Chandra and XMM-Newton X-ray observatories of RCW 86 [in the constellation Circinus showing] the expanding ring of debris that was created after a massive star in the Milky Way collapsed onto itself and exploded. Both the Chandra and XMM images show low energy X-rays in red, medium energies in green and high energies in blue. The Chandra observations focused on the northeast (left-hand) side of RCW 86, and show that X-ray radiation is produced both by high-energy electrons accelerated in a magnetic field (blue) as well as heat from the blast itself (red)." "Properties of the shell in the Chandra image, along with the remnant's size and a basic understanding of how supernovas expand, were used to help determine the age of RCW 86. The new data revealed that RCW 86 was created by a star that exploded about 2,000 years ago. This age matches observations of a new bright star by Chinese astronomers in 185 A.D. (and possibly Romans as well) and may be the oldest known recordings of a supernova. Supernova explosions in galaxies like ours are rare, and none have been recorded in hundreds of years." Rosat image of the Vela supernova remnant and its surroundings. Credit: H.E.S.S. collaboration, F. Aharonian et al. "A source of hard X-radiation has been detected in the general direction of the Vela X supernova remnant." On the right is a "Rosat image of the Vela supernova remnant and its surroundings, for X-ray energies above 1.3 keV, showing the big Vela remnant, the small Puppis-A supernova remnant in the upper right, and in this image newly discovered remnant RX J0852.0-4622 in the lower left (Aschenbach, 1998)." "The supernova remnant RX J1713.7-3946 [...] was the first remnant where the shell structure was detected in VHE gamma rays, demonstrating that the supernova shock wave accelerates particles. The detailed interpretation is complicated by the fact that there is significant uncertainty in a number of crucial parameters, such as the distance to the remnant and the characteristics of the ambient interstellar medium. It is therefore important to enlarge the ensemble of supernova remnants studied in VHE gamma rays, which allows one to average over such parameters and to extract the key features. "Vela Junior", or RX J0852.0-4622 is supernova remnant discovered in 1998 in ROSAT X-ray images (Aschenbach 1998, Aschenbach at al. 1999). The remnant is only a faint radio emitter (Duncan & Green, 2000) and was not identified in earlier radio surveys. Age and distance are estimated to 680 years and 200 pc (Aschenbach at al. 1999). It has been argued that three nearby supernova explosions might be responsible for spikes in the nitrate abundance found in South Pole ice cores (Rood et al, 1979); with an age around 700 years, the Vela Junior supernova might be responsible for a fourth, previously unidentified spike (Burgess and Zuber, 2000) (Fig. 1). The CANGAROO instrument reported the detection at the 6 sigma level of VHE gamma rays from the north-western part of Vela Junior, based on about 100 h of observations (Katagiri et al., 2005)." "With the H.E.S.S. telescopes, a clear signature of Vela Junior in VHE gamma rays was detected in only 3.2 h of exposure, with a significance of 12 sigma [...]. In the H.E.S.S. image, a shell-like morphology is clearly visible, coincident with the X-ray morphology of the remnant. The radius of the shell is almost 2 degrees, with a peak of VHE emission in the north-western (upper-left) section of the remnant. The total flux from the remnant is at the same level as the flux from the Crab Nebula, which makes it one of the strongest galactic sources of VHE gamma rays. The close resemblance between the X-ray image and the gamma-ray image is demonstrated by a correlation coefficient of 0.7, obtained by dividing the image into bins of 0.4 by 0.4 degrees. X-ray images show a compact X-ray source at the center of the remnant (AX J0851.9-4617.4, Slane et al. 2001), which could be a neutron star created in the explosion; in the H.E.S.S. image, no significant gamma-ray excess from this object is detected." The Crab Nebula is a remnant of an exploded star. This image shows the Crab Nebula in various energy bands: radio, infrared, visual, ultraviolet, soft and hard X-ray from the HEFT data taken during its 2005 observation run. Each image is 6′ wide. Credit: NASA. On July 21, 1964, the Crab Nebula supernova remnant was discovered to be a hard X-ray (15 – 60 keV) source by a scintillation counter flown on a balloon launched from Palestine, Texas, USA. This was likely the first balloon-based detection of X-rays from a discrete cosmic X-ray source. The high-energy focusing telescope (HEFT) is a balloon-borne experiment to image astrophysical sources in the hard X-ray (20–100 keV) band. "Its maiden flight took place in May 2005 from Fort Sumner, New Mexico, USA. The angular resolution of HEFT is ~1.5'. Rather than using a grazing-angle X-ray telescope, HEFT makes use of a novel tungsten-silicon multilayer coatings to extend the reflectivity of nested grazing-incidence mirrors beyond 10 keV. HEFT has an energy resolution of 1.0 keV full width at half maximum at 60 keV. HEFT was launched for a 25-hour balloon flight in May 2005. The instrument performed within specification and observed Tau X-1, the Crab Nebula." Inside the white circle is a new supernova remnant in Antlia. Credit: P. R. McCullough, Brian D. Fields, and Vasiliki Pavlidou. At right is a ROSAT X-ray image of a SNR in Antlia from the ROSAT all-sky survey published in 1997. The Chandra three-color image (inset) is a region of the supernova remnant Puppis A (wide-angle view from ROSAT in blue) which reveals a cloud being torn apart by a shock wave produced in a supernova explosion. Color code: Energy (Red 0.4-0.7 keV; Green 0.7-1.2 keV; Blue 1.2-10 keV). Instrument: ACIS. Credit: Chandra: NASA/CXC/GSFC/U.Hwang et al. ; ROSAT: NASA/GSFC/S.Snowden et al. The destructive results of a powerful supernova explosion reveal themselves in a delicate tapestry of X-ray light. Credit: X-ray: NASA/CXC/IAFE/G.Dubner et al & ESA/XMM-Newton. Puppis X-1 (Puppis A) was discovered by a Skylark flight in October 1971, viewed for 1 min with an accuracy ≥ 2 arcsec, probably at 1M 0821-426, with Puppis A (RA 08h 23m 08.16s Dec -42º 41' 41.40") as the likely visual counterpart. Puppis A is one of the brightest X-ray sources in the X-ray sky. Its X-ray designation is 2U 0821-42. At right is a composite X-ray image of Puppis A. The Chandra three-color image (inset) is a region of the supernova remnant Puppis A (wide-angle view from ROSAT in blue) which reveals a cloud being torn apart by a shock wave produced in a supernova explosion. The ROSAT image is 88 arcmin across; Chandra image 8 arcmin across. Location for Puppis A is RA 08h 23m 08.16s Dec -42º 41' 41.40". The observation date is September 4, 2005. "Puppis A [at (J2000) RA 08h 23m 08.16s | Dec -42º 41' 41.40"] is a supernova remnant located about 7,000 light years from Earth." "This new image [on the left] includes data from Chandra and XMM-Newton and is the most complete and detailed X-ray view of Puppis A to date [9 pointings between January and November 2000 - 2010]." "The image shows the remains of a supernova that would have been witnessed on Earth about 3,700 years ago. The remnant is called Puppis A, and is around 7,000 light years away and about 10 light years across. This image provides the most complete and detailed X-ray view of Puppis A ever obtained, made by combining a mosaic of different Chandra and XMM-Newton observations. Low-energy X-rays are shown in red, medium-energy X-rays are in green and high energy X-rays are colored blue." "These observations act as a probe of the gas surrounding Puppis A, known as the interstellar medium. The complex appearance of the remnant shows that Puppis A is expanding into an interstellar medium that probably has a knotty structure." This is the supernova remnant CTA 1. Credit: NASA. SS 433 is one of the most exotic star systems observed. It is an eclipsing binary with the primary either a black hole or neutron star and the secondary is a late A-type star. SS 433 lies within supernova remnant W50. The material in the jet traveling from the secondary to the primary does so at 26% of light speed. The spectrum of SS 433 is affected by Doppler shifts and by relativity: when the effects of the Doppler shift are subtracted, there is a residual redshift which corresponds to a velocity of about 12,000 kps. This does not represent an actual velocity of the system away from the Earth; rather, it is due to time dilation, which makes moving clocks appear to stationary observers to be ticking more slowly. In this case, the relativistically moving excited atoms in the jets appear to vibrate more slowly and their radiation thus appears red-shifted. Chandra X-ray Observatory image shows the supernova Kes 75 with the young, normal pulsar, neutron star PSR J1846-0258 in the center of the blue area at the top. These Chandra X-ray Observatory images show PSR J1846-0258 in Kes 75 on October 2000 (left) and June 2006 (right). The pulsar brightened in X-rays after giving off powerful outbursts earlier in 2006. On March 5, 1979, after dropping probes into the atmosphere of Venus, Venera 11 and Venera 12, while in heliocentric orbits, were hit at 10:51 am EST by a blast of gamma ray radiation. This contact raised the radiation readings on both the probes Konus experiments from a normal 100 counts per second to over 200,000 counts a second, in only a fraction of a millisecond. This giant flare was detected by numerous spacecraft and with these detections was localized by the interplanetary network to SGR 0526-66 inside the N-49 SNR of the Large Magellanic Cloud. "We are watching one type of neutron star literally change into another right before our very eyes. This is a long-sought missing link between different types of pulsars." PSR J1846-0258 is in the constellation Aquila. It had been classed as a normal pulsar because of its fast spin (3.1 s−1) and pulsar-like spectrum. RXTE caught four magnetar-like X-ray bursts on May 31, 2006, and another on July 27, 2006. Although none of these events lasted longer than 0.14 second, they all packed the wallop of at least 75,000 Suns. "Never before has a regular pulsar been observed to produce magnetar bursts." "Young, fast-spinning pulsars were not thought to have enough magnetic energy to generate such powerful bursts. Here's a normal pulsar that's acting like a magnetar." The observations from NASA's Chandra X-ray Observatory showed that the object had brightened in X-rays, confirming that the bursts were from the pulsar, and that its spectrum had changed to become more magnetar-like. The fact that PSR J1846's spin rate is decelerating also means that it has a strong magnetic field braking the rotation. The implied magnetic field is trillions of times stronger than Earth's field, but it's 10 to 100 times weaker than a typical magnetar. "PSR J1846's actual magnetic field could be much stronger than the measured amount, suggesting that many young neutron stars classified as pulsars might actually be magnetars in disguise, and that the true strength of their magnetic field only reveals itself over thousands of years as they ramp up in activity." G299 was left over by a particular class of supernovas called Type Ia. Credit: X-ray: NASA/CXC/U.Texas/S.Post et al, Infrared: 2MASS/UMass/IPAC-Caltech/NASA/NSF. This composite image shows G299.2-2.9 in X-ray light from Chandra (orange) that has been overlaid on an infrared image from the Two Micron All-Sky Survey (2MASS). Credit: X-ray: NASA/CXC/U. Texas at Arlington/S.Park et al, ROSAT; Infrared: 2MASS/UMass/IPAC-Caltech/NASA/NSF. "The shape of the supernova remnant today gives clues about the explosion that created it about 4,500 years ago." "G299.2-2.9 [at RA 12h 15m 33.80s | Dec -65° 26' 33.90", Musca] belongs to the class of supernovas known as Type Ias." "Type Ia supernovas have long been known to be uniform in their extreme brightness, usually outshining the entire galaxy where they are found." "In this new Chandra image, red, green, and blue represent low, medium, and high-energy X-rays, respectively, detected by the telescope. The medium energy X-rays include emission from iron and the high-energy X-rays include emission from silicon and sulfur. The X-ray data have been combined with infrared data from ground-based 2MASS survey that shows the stars in the field of view. [10 pointings between 9 April and 13 November 2005 - 2010]"
Clear "examples of asymmetry in G299 [include] the ratio between the amounts of iron and silicon in the part of the remnant just above the center is larger than in the part of the remnant just below the center. This difference can be seen in the greener color of the upper region compared to the bluer color of the lower region. Also, there is a strongly elongated portion of the remnant extending to the right. In this region, the relative amount of iron to silicon is similar to that found in the southern region of the remnant." "The patterns seen in the Chandra data suggest that a very lopsided explosion may have produced this Type Ia supernova." "G299.2-2.9 is a supernova remnant found about 16,000 light years from Earth in the Milky Way galaxy." "This composite image [on the left] shows G299.2-2.9 in X-ray light from Chandra [Gold, 10 pointings between 9 April and 13 November 2005 - 2010], along with data from the ROSAT satellite (orange), that has been overlaid on an infrared [Red, Green, Blue] image from the Two Micron All-Sky Survey (2MASS). The faint X-ray emission from the inner region reveals relatively large amounts of iron and silicon, as expected for a remnant of a Type Ia supernova. The outer shell of the remnant is complex, with at least a double shell structure. Typically, such a complex outer shell is associated with a star that has exploded into space where gas and dust are not uniformly distributed." X-ray & infrared images of W44 make up this composite. Credit: X-ray: NASA/CXC/Univ. of Georgia/R.Shelton & NASA/CXC/GSFC/R.Petre; Infrared: NASA/JPL-Caltech. Gamma-ray "emission matches remarkably well both the position and shape of the inner [W44] SNR shocked plasma. Furthermore, the gamma-ray spectrum shows a prominent peak near 1 GeV with a clear decrement at energies below a few hundreds of MeV as expected from neutral pion decay." "Also known as G34.7-0.4, W44 [at (J2000) RA 18h 55m 59.3s | Dec +01° 20' 07.0" in Aquila about 8300 light years away] is an expanding supernova remnant that is interacting with dense interstellar material that surrounds it. 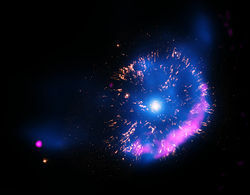 X-rays from Chandra (blue [between 31 October 23 and 25 June 2000 - 2005]) show that hot gas fills the shell of the supernova remnant as it moves outward. Infrared observations from the Spitzer Space Telescope reveal the shell of the supernova remnant (green) as well as the molecular cloud (red) into which the supernova remnant is moving and the stars in the field of view." "Mini Supernova" Explosion Could Have Big Impact. Credit: X-ray: NASA/CXC/RIKEN/D.Takei et al; Optical: NASA/STScI; Radio: NRAO/VLA. X-ray source: 1A 0327+43, 3A 0327+438, 2E 785, 2E 0327.7+4344, PBC J0331.1+4353, 1RXS J033111.9+435427, SWIFT J0331.1+4355, SWIFT J0331.2+4354. "Using NASA’s Chandra X-ray Observatory, astronomers [...] pointed the telescope at GK Persei, an object that became a sensation in the astronomical world in 1901 when it suddenly appeared as one of the brightest stars in the sky for a few days, before gradually fading away in brightness." "GK Persei [is] an example of a “classical nova,” an outburst produced by a thermonuclear explosion on the surface of a white dwarf star, the dense remnant of a Sun-like star." "Chandra first observed GK Persei in February 2000 and then again in November 2013. This 13-year baseline provides astronomers with enough time to notice important differences in the X-ray emission and its properties." "This new image [on the right] of GK Persei contains X-rays from Chandra (blue), optical data from NASA’s Hubble Space Telescope (yellow), and radio data from the National Science Foundation’s Very Large Array (pink). The X-ray data show hot gas and the radio data show emission from electrons that have been accelerated to high energies by the nova shock wave. The optical data reveal clumps of material that were ejected in the explosion. The nature of the point-like source on the lower left is unknown." "The X-ray luminosity of the GK Persei remnant decreased by about 40% over the 13 years between the Chandra observations, whereas the temperature of the gas in the remnant has essentially remained constant, at about one million degrees Celsius. As the shock wave expanded and heated an increasing amount of matter, the temperature behind the wave of energy should have decreased. The observed fading and constant temperature suggests that the wave of energy has swept up a negligible amount of gas in the environment around the star over the past 13 years. This suggests that the wave must currently be expanding into a region of much lower density than before, giving clues to stellar neighborhood in which GK Persei resides." E0102-72 is a supernova remnant in the Small Magellanic Cloud, a satellite galaxy of the Milky Way. Credit: NASA/CXC/SAO. Chandra finds an oxygen ring in ashes of exploded star. Credit: NASA/MIT/C. Canizares, J. Houck. E0102-72 is the remnant of a star that exploded in a nearby galaxy known as the Small Magellanic Cloud. Credit: X-ray: NASA/CXC/SAO, Optical: NASA/HST, Radio: CSIRO/ATNF/ATCA. This color composite of the supernova remnant E0102-72 includes infrared instead of radio. Credit: X-ray: NASA/CXC/SAO; Optical: NASA/STScI; Infrared: NASA/JPL-Caltech/UC Berkeley/S. Stanimirovic. New X-ray data have now been used to create this spectacular image of 1E 0102.2-7219. Credit: X-ray (NASA/CXC/MIT/D.Dewey et al. & NASA/CXC/SAO/J.DePasquale); Optical (NASA/STScI). "E0102-72 [on the left at (J2000) RA 01h 04m 02.40s | Dec -727deg; 01' 55.30" in Tucana, also known as SN010102-72, from 20 September 1999] is a supernova remnant in the Small Magellanic Cloud, a satellite galaxy of the Milky Way. This galaxy is 190,000 light years from Earth. E0102 -72, which is approximately a thousand years old, is believed to have resulted from the explosion of a massive star. Stretching across forty light years of space, the multi-million degree source resembles a flaming cosmic wheel. [...] The striking image of the supernova remnant E0102-72 shows puzzling spoke-like structures in its interior." "This X-ray image [on the right] of the supernova remnant E0102-72 shows an expanding multimillion degree ring of oxygen that was created deep inside a massive star and hurled into space by the explosion of the star. The ring is about 30 light years across and contains more than a billion times the oxygen contained in the Earth's ocean and atmosphere. Images such as these provide unprecedented details about the creation and dispersal of heavy elements necessary to form planets like Earth. E0102-72 is in the Small Magellanic Cloud a small galaxy about 200,000 light years from Earth." "Color composite of the supernova remnant E0102-72: X-ray (blue), optical (green), and radio (red) [second image down on the left]. E0102-72 is the remnant of a star that exploded in a nearby galaxy known as the Small Magellanic Cloud. The galaxy is approximately 190,000 light years from Earth, so we see the remnant as it was about 190,000 years ago, around a thousand years after the explosion occurred." "The star exploded outward at speeds in excess of 20 million kilometers per hr (12 million mph) and collided with surrounding gas. This collision produced two shock waves, or cosmic sonic booms one traveling outward, and the other rebounding back into the material ejected by the explosion." "The radio image was made using the Australia Telescope Compact Array. The radio waves are due to extremely high-energy electrons spiraling around magnetic field lines in the gas and trace the outward moving shock wave." "The Chandra X-ray image, shown in blue, shows gas that has been heated to millions of degrees Celsius by the rebounding, or reverse shock wave. The X-ray data show that this gas is rich in oxygen and neon. These elements were created by nuclear reactions inside the star and hurled into space by the supernova." "The Hubble Space Telescope optical image shows dense clumps of oxygen gas that have "cooled" to about 30,000 degree Celsius." "This image [image at center] of the debris of an exploded star - known as supernova remnant 1E 0102.2-7219, or "E0102" for short - features data from NASA's Chandra X-ray Observatory [25 pointings between 10 December - 09 February 2000 - 2008]. E0102 is located about 190,000 light years away in the Small Magellanic Cloud, one of the nearest galaxies to the Milky Way. It was created when a star that was much more massive than the Sun exploded, an event that would have been visible from the Southern Hemisphere of the Earth over 1000 years ago." "New X-ray data have now been used to create this spectacular image and help celebrate the ten-year anniversary of Chandra's launch on July 23, 1999. In this latest image of E0102, the lowest-energy X-rays are colored orange, the intermediate range of X-rays is cyan, and the highest-energy X-rays Chandra detected are blue. An optical image from the Hubble Space Telescope (in red, green and blue) shows additional structure in the remnant and also reveals foreground stars in the field." "The Chandra image shows the outer blast wave produced by the supernova (blue), and an inner ring of cooler (red-orange) material. This inner ring is probably expanding ejecta from the explosion that is being heated by a shock wave traveling backwards into the ejecta. A massive star (not visible in this image) is illuminating the green cloud of gas and dust to the lower right of the image. This star may have similar properties to the one that exploded to form E0102." "A clear separation was detected between the red-shifted and blue-shifted light, leading astronomers to think that the appearance of E0102 is best explained by a model in which the ejecta is shaped like a cylinder that is being viewed almost exactly end-on [...]. The smaller red and blue cylinders represent faster moving material closer to the cylinder axis." "This model suggests that the explosion that created the E0102 remnant may itself have been strongly asymmetric, consistent with the rapid kicks given to neutron stars after supernova explosions. Another possibility is that the star exploded into a disk of material formed when material was shed from the equator of the pre-supernova red giant star. Such asymmetries have been observed in winds from lower mass red giants that form planetary nebulas." At left is a multiwavelength composite that shows the supernova remnant IC 443, also known as the Jellyfish Nebula. Fermi GeV gamma-ray emission is shown in magenta, optical wavelengths as yellow, and infrared data from NASA's Wide-field Infrared Survey Explorer (WISE) mission is shown as blue (3.4 microns), cyan (4.6 microns), green (12 microns) and red (22 microns). Cyan loops indicate where the remnant is interacting with a dense cloud of interstellar gas. On the right is an image of the Supernova Remnant IC 443. The image combines optical data from the Digitized Sky Survey (in yellow) and X-ray data from the XMM-Newton Observatory (in blue). The bright spot is the star Eta Geminorum. This is an X-ray image of two hot gas shells produced by supernova explosions. Credit: X-ray: NASA/CXC/U.Illinois/R.Williams & Y.-H.Chu; Optical: NOAO/CTIO/U.Illinois/R.Williams & MCELS coll. "This composite X-ray (red and green)/optical (blue) image reveals a cat-shaped image produced by the remnants of two exploded stars in the Large Magellanic Cloud galaxy [in Dorado at (J2000) RA 05h 47m 15.00s | Dec -69º 42' 25.00" about 160,000 light years also known as WCD97 Shell A, WCD97 Shell B]. Although the shells of hot gas appear to be colliding, this may be an illusion." "Chandra X-ray spectra show that the hot gas shell on the upper left [Shell A] contains considerably more iron [green] than the one on the lower right [Shell B]. The high abundance of iron implies that this supernova remnant is the product of a Type Ia supernova triggered by the infall of matter from a companion star onto a white dwarf star." "In contrast, the much lower abundance of iron in the lower supernova remnant indicates that it was a Type II supernova produced by the explosion of a young, massive star. It takes billions of years to form a white dwarf star, whereas a massive young star will explode in a few million years. The disparity of ages in the progenitor stars means that it is very unlikely that they exploded very close to each other. The apparent proximity of the remnants is probably the result of a chance alignment." Since many neutrinos are assumed to come from stellar cores and supernovae, they are released at great temperature/energy. As neutrinos do not interact with matter electromagnetically, they are by definition dark matter. The field of neutrino astronomy is still very much in its infancy – the only confirmed extraterrestrial sources so far are the Sun and supernova SN1987A. X-rays remove electrons from atoms and ions, and those photoelectrons can provoke secondary ionizations. As the intensity is often low, this X-ray heating is only efficient in warm, less dense atomic medium (as the column density is small). For example in molecular clouds only hard x-rays can penetrate and x-ray heating can be ignored. This is assuming the region is not near an x-ray source such as a supernova remnant. This all-sky view from GLAST reveals bright gamma-ray emission in the plane of the Milky Way (center), including the bright Geminga pulsar. Credit: NASA/DOE/International LAT Team. Over the entire celestial sphere, SIMBAD currently records 3253 gamma-ray objects. Some of these, like 4U 1705-44, are low-mass X-ray binaries (LMXBs). Some, like V779 Centauri, are high-mass X-ray binaries (HXMBs). Others are quasi-stellar objects (PKS 1326-697), supernova remnants (SNRs) like Messier 1 (M 1), and Seyfert galaxies like M 98. Some gamma-ray emitting objects have not been sufficiently resolved to determine what they are. This is an XMM Newton image of the Gemini gamma-ray source. Credit: P.A. Caraveo (INAF/IASF), Milan and ESA. From 0.1 nm to 0.01 nm (about 12 to 120 keV) are hard X-rays. The gamma-ray source Geminga, shown at right in hard X-rays by the satellite XMM Newton, is first observed by the Second Small Astronomy Satellite (SAS-2). Geminga may be a sort of neutron star: the decaying core of a massive star that exploded as a supernova about 300,000 years ago. "Geminga is a very weak neutron star and the pulsar next to us, which almost only emits extremely hard gamma-rays, but no radio waves. ... Some thousand years ago our Sun entered this [Local Bubble] several hundred light-years big area, which is nearly dust-free." The nature of Geminga was quite unknown for 20 years after its discovery by NASA's Second Small Astronomy Satellite (SAS-2). In March 1991 the ROSAT satellite detected a periodicity of 0.237 seconds in soft x-ray emission. This nearby explosion may be responsible for the low density of the interstellar medium in the immediate vicinity of the Solar System. This low-density area is known as the Local Bubble. Possible evidence for this includes findings by the Arecibo Observatory that local micrometre-sized interstellar meteor particles appear to originate from its direction. Geminga is the first example of a radio-quiet pulsar, and serves as an illustration of the difficulty of associating gamma-ray emission with objects known at other wavelengths: either no credible object is detected in the error region of the gamma-ray source, or a number are present and some characteristic of the gamma-ray source, such as periodicity or variability, must be identified in one of the prospective candidates (or vice-versa as in the case of Geminga). A super soft X-ray source (SSXS, or SSS) is an astronomical source of very low energy X-rays. Soft X-rays have energies in the 0.09 to 2.5 keV range, whereas hard X-rays are in the 1-20 keV range. SSXSs are in most cases only detected below 0.5 keV, so that within our own galaxy they are usually hidden by interstellar absorption in the galactic disk. They are readily evident in external galaxies, with ~10 found in the Magellanic Clouds and at least 15 seen in M31. As of early 2005, more than 100 SSSs have been reported in ~20 external galaxies, the Large Magellanic Cloud (LMC), Small Magellanic Cloud (SMC), and the Milky Way (MW). Those with luminosities below ~3 x 1038 erg/s are consistent with steady nuclear burning in accreting white dwarfs (WD)s or post-novae. There are a few SSS with luminosities ≥1039 erg/s. Super soft X-rays are believed to be produced by steady nuclear fusion on a white dwarf's surface of material pulled from a binary companion, the so-called close-binary supersoft source (CBSS). This requires a flow of material sufficiently high to sustain the fusion. Contrast this with the nova, where less flow causes the material to only fuse sporadically. Super soft X-ray sources can evolve into type Ia supernova, where a sudden fusion of material destroys the white dwarf, and neutron stars, through collapse. Super soft X-ray sources were first discovered by the Einstein Observatory. Further discoveries were made by ROSAT. Many different classes of objects emit supersoft X-radiation (emission dominantly below 0.5 keV). "[T]he ultrasoft X-ray emission (peak energy 30-50 eV) observed in the three strong (≥ 4 1037-1038 erg s-1) LMC X-ray sources CAL83, CAL87 and RXJ0527.8-6954 can be explained by steady nuclear burning of hydrogen accreted onto white dwarfs with masses in the range of 0.7 to 1.2 Mʘ." "The tachyonic spectral densities generated by ultra-relativistic electrons in uniform motion are fitted to the high-energy spectra of Galactic supernova remnants, such as RX J0852.0−4622 and the pulsar wind nebulae in G0.9+0.1 and MSH 15-52. ... Tachyonic cascade spectra are quite capable of generating the spectral curvature seen ... Estimates on the electron/proton populations generating the tachyon flux are obtained from the spectral fits"
This ROSAT image is an Aitoff-Hammer equal-area map in galactic coordinates with the Galactic center in the middle of the 0.25 keV diffuse X-ray background. Credit: NASA. Of interest is the hot ionized medium (HIM) consisting of a coronal cloud ejection from star surfaces at 106-107 K which emits X-rays. The ISM is turbulent and full of structure on all spatial scales. Stars are born deep inside large complexes of molecular clouds, typically a few parsecs in size. During their lives and deaths, stars interact physically with the ISM. Stellar winds from young clusters of stars (often with giant or supergiant HII regions surrounding them) and shock waves created by supernovae inject enormous amounts of energy into their surroundings, which leads to hypersonic turbulence. The resultant structures are stellar wind bubbles and superbubbles of hot gas. The Sun is currently traveling through the Local Interstellar Cloud, a denser region in the low-density Local Bubble." Most astronomical X-ray transient sources have simple and consistent time structures; typically a rapid brightening followed by gradual fading, as in a nova or supernova. Nuclear fusion is the process by which two or more atomic nuclei join together, or "fuse", to form a single heavier nucleus. This is usually accompanied by the release or absorption of large quantities of energy. Fusion is the process that powers active stars, the hydrogen bomb and some experimental devices examining fusion power for electrical generation. The fusion of two nuclei with lower masses than iron (which, along with nickel, has the largest binding energy per nucleon) generally releases energy, while the fusion of nuclei heavier than iron absorbs energy. The opposite is true for the reverse process, nuclear fission. This means that fusion generally occurs for lighter elements only, and likewise, that fission normally occurs only for heavier elements. There are extreme astrophysical events that can lead to short periods of fusion with heavier nuclei. This is the process that gives rise to nucleosynthesis, the creation of the heavy elements during events such as supernovas. In astrophysics, silicon burning is a very brief sequence of nuclear fusion reactions that occur in massive stars with a minimum of about 8–11 solar masses. Silicon burning is the final stage of fusion for massive stars that have run out of the fuels that power them for their long lives in the main sequence on the Hertzsprung-Russell diagram. It follows the previous stages of hydrogen, helium (the triple-alpha process), carbon, neon and oxygen burning processes. Silicon burning begins when gravitational contraction raises the star’s core temperature to 2.7–3.5 billion kelvins (GK). The exact temperature depends on mass. When a star has completed the silicon-burning phase, no further fusion is possible. The star catastrophically collapses and may explode in what is known as a Type II supernova. "Measurements of fluorine in the interstellar medium (Federman et al. 2005) show no evidence of F overabundances due to the neutrino process in Type II supernova." The neutrino oscillation signatures are discussed regarding "flavor conversion of neutrinos from core-collapse supernovae that have oxygen-neon-magnesium (ONeMg) cores." "The isotope 92Nb decays to 92Zr with a half-life of 3.47 × 107 yr. Although this isotope does not exist in the current solar system, initial abundance ratios for 92Nb/93Nb at the time of solar system formation have been measured in primitive meteorites." A "novel origin for 92Nb may be via neutrino-induced reactions in core-collapse supernovae (ν-process)." The "observed ratio of 92Nb/93Nb ~ 10-5 can be explained by the ν-process. A recurrent nova is produced by a white dwarf star and a red giant circling about each other in a close orbit. About every 20 years, enough material from the red giant builds up on the surface of the white dwarf to produce a thermonuclear explosion. The white dwarf orbits close to the red giant, with an accretion disc concentrating the overflowing atmosphere of the red giant onto the white dwarf. If the white dwarf accretes enough mass to reach the Chandrasekhar limit, about 1.4 solar mass, it may explode as a Type Ia supernova. "Type Ia supernovae occur in a binary system — two stars orbiting one another. One of the stars in the system must be a white dwarf star, the dense, carbon remains of a star that was about the size of our Sun. The other can be a giant star or even a smaller white dwarf." "When a runaway thermonuclear explosion rips through a white dwarf star and blows the star to bits, it’s called a type 1a supernova." "The star doing the exploding is a white dwarf with a fairly standard mass, so the supernova’s brightness is predictable." "Chemical signatures [gamma-rays are formed from the synthesis of iron, cobalt, and nickel] in the billowing debris cloud revealed that supernova 2014J, as it’s called, [was a white dwarf star, with about 1.4 solar masses] is a type 1a supernova." “Fusion happens in a flash." It is a type of stellar remnant (a compact star) that can result from the gravitational collapse of a massive star during a Type II, Type Ib or Type Ic supernova event. Such stars are composed almost entirely of neutrons. "[T]he equation of state of [hot dense matter] in the infalling core of a star undergoing the collapse ... ultimately may lead to a type II supernova (Lattimer, 1981)." ↑ F. W. Giacobbe (2005). "How a Type II Supernova Explodes". Electronic Journal of Theoretical Physics 2 (6): 30–38. ↑ Introduction to Supernova Remnants. NASA/Goddard Space Flight Center. 27 July 2006. Retrieved 2006-09-07. ↑ Schawinski, K. et al (2008). "Supernova Shock Breakout from a Red Supergiant". Science 321 (5886): 223. doi:10.1126/science.1160456. PMID 18556514. ↑ 213.208.107.91 (15 November 2004). supernova. San Francisco, California: Wikimedia Foundation, Inc. Retrieved 2016-09-29. ↑ H. Roth (1932). "A Slowly Contracting or Expanding Fluid Sphere and its Stability". Physical Review 39 (3): 525–9. doi:10.1103/PhysRev.39.525. ↑ A. S. Eddington (1926). Internal Constitution of the Stars. New York: Cambridge University Press. ISBN 0-521-33708-9. ↑ 7.0 7.1 7.2 Anthony Mezzacappa (11 December 2012). Computational Astrophysics. Oak Ridge, Tennessee USA: Oak Ridge National Laboratory. Retrieved 2013-07-04. ↑ Biermann, P. L.; Langer, N.; Seo, Eun-Suk; Stanev, T. (April 2001). "Cosmic rays IX. Interactions and transport of cosmic rays in the Galaxy". Astronomy and Astrophysics 369 (4): 269-77. doi:10.1051/0004-6361:20010083. ↑ Lynn Jenner (4 October 2006). Mug Shots of Supernovas Reveal Two Key Findings. Washington, DC USA: NASA. Retrieved 2016-12-01. ↑ 12.0 12.1 Hubble Revisits an Old Friend, In: Picture of the Week. ESA/Hubble. Retrieved 17 October 2011. ↑ 13.0 13.1 W. David Arnett, John N. Bahcall, Robert P. Kirshner, and Stanford E. Woosley (1989). "Supernova 1987A". Annual Review of Astronomy and Astrophysics 27: 629-700. doi:10.1146/annurev.aa.27.090189.003213. http://articles.adsabs.harvard.edu/full/1989ARA%26A..27..629A. Retrieved 2013-05-31. ↑ G. Sonneborn (1987). Minas Kafatos, Andreas Gerasimos Michalitsianos, ed. The Progenitor of SN1987A, In: Supernova 1987a in the Large Magellanic Cloud. Cambridge University Press. ISBN 0-521-35575-3. ↑ 15.0 15.1 15.2 Figueiredo N, Villela T, Jayanthi UB, Wuensche CA, Neri JACF, Cesta RC (1990). "Gamma-ray observations of SN1987A". Rev Mex Astron Astrofis. 21: 459–62. ↑ KENNETH CHANG (26 April 2005). Tiny, Plentiful and Really Hard to Catch, In: The New York Times. Retrieved 2011-06-16. ↑ E. Helder (January 2008). X-ray & Optical Images of SN 1987A. 60 Garden Street, Cambridge, MA 02138 USA: Harvard-Smithsonian Center for Astrophysics. Retrieved 2016-12-07. ↑ 20.0 20.1 S. Park, D. Burrows and P. Challis (9 January 2005). Supernova 1987A: Twenty Years Since a Spectacular Explosion. 60 Garden Street, Cambridge, MA 02138 USA: Harvard-Smithsonian Center for Astrophysics. Retrieved 2016-12-08. ↑ Hughes DW (1980). "Did Flamsteed see the Cassiopeia A supernova?". Nature 285 (5761): 132. doi:10.1038/285132a0. ↑ Pavlov GG, Zavlin VE, Aschenbach B, Trumper J, Sanwal D (2000). "The Compact Central Object in Cassiopeia A: A Neutron Star with Hot Polar Caps or a Black Hole?". The Astrophysical Journal 531 (1): L53–6. doi:10.1086/312521. PMID 10673413. ↑ S. Bowyer, E. T. Byram, T. A. Chubb and H. Friedman (1965). Jean-Louis Steinberg. ed. Observational results of X-ray astronomy, In: Astronomical Observations from Space Vehicles. Proceedings from Symposium no. 23 held in Liege, Belgium, 17 to 20 August 1964: International Astronomical Union. pp. 227-39. http://adsabs.harvard.edu/cgi-bin/nph-data_query?bibcode=1965IAUS...23..227B&link_type=ARTICLE&db_key=AST&high=4ebb0ab57b11987. Retrieved 2012-01-01. ↑ Fisher PC, Johnson HM, Jordan WC, Meyerott AJ, Acton LW (1966). "Observations of Cosmic X-rays". The Astrophysical Journal 143: 203–17. doi:10.1086/148491. ↑ Byram ET, Chubb TA, Friedman H (April 1966). "Cosmic X-ray Sources, Galactic and Extragalactic". Science 152 (3718): 66–71. doi:10.1126/science.152.3718.66. PMID 17830233. http://www.sciencemag.org/cgi/content/abstract/152/3718/66. ↑ Friedman H, Byram ET, Chubb TA (April 1967). "Distribution and Variability of Cosmic X-Ray Sources". Science 156 (3773): 374–8. doi:10.1126/science.156.3773.374. PMID 17812381. http://www.sciencemag.org/cgi/content/abstract/156/3773/374. ↑ Webber WR (December 1968). "X-ray astronomy-1968 vintage". Proc Astron Soc Australia. : 160–4. ↑ 31.0 31.1 31.2 31.3 31.4 U. Hwang (23 August 2004). Cassiopeia A: Deepest Image of Exploded Star Uncovers Bipolar Jets. 60 Garden Street, Cambridge, MA 02138 USA: Harvard-Smithsonian Center for Astrophysics. Retrieved 2013-12-24. ↑ R. Sankrit & W. Blair (August 2004). Kepler's supernova. Washington, DC USA: NASA. Retrieved 2016-11-30. ↑ F. R. Harnden, Jr., W. N. Johnson III, and R. C. Haymes (15 March 1972). "Evidence for Hard X-ray Pulsations from the Vela Pulsar". The Astrophysical Journal 172 (03): L91-4. http://articles.adsabs.harvard.edu/cgi-bin/nph-iarticle_query?1972ApJ...172L..91H&data_type=PDF_HIGH&whole_paper=YES&type=PRINTER&filetype=.pdf. Retrieved 2015-12-19. ↑ 38.0 38.1 38.2 Marshallsumter (15 April 2013). X-ray astronomy. San Francisco, California: Wikimedia Foundation, Inc. Retrieved 2013-05-11. ↑ S. A. Drake. A Brief History of High-Energy Astronomy: 1960–1964. ↑ F. A. Harrison, Steven Boggs, Aleksey E. Bolotnikov, Finn E. Christensen, Walter R. Cook III, William W. Craig, Charles J. Hailey, Mario A. Jimenez-Garate, Peter H. Mao (2000). Joachim E. Truemper, Bernd Aschenbach. ed. "Development of the High-Energy Focusing Telescope (HEFT) balloon experiment". Proc SPIE. X-Ray Optics, Instruments, and Missions III 4012: 693. doi:10.1117/12.391608. ↑ P. R. McCullough, Brian D. Fields, and Vasiliki Pavlidou (1 September 2002). "Discovery of an Old, Nearby, and Overlooked Supernova Remnant Centered on the Southern Constellation Antlia Pneumatica". The Astrophysical Journal 576: L41-4. http://iopscience.iop.org/1538-4357/576/1/L41/pdf/1538-4357_576_1_L41.pdf. Retrieved 2014-05-20. ↑ Wiggin M (December 2000). The Dome on Ball Hill – The RAE Observatory (PDF). ↑ Atkinson N (17 October 2008). Universe Today – Fermi Telescope Makes First Big Discovery: Gamma Ray Pulsar. ↑ Ouellette GA (1967). "Development of a catalogue of galactic x-ray sources". Astron J 72: 597. doi:10.1086/110278. ↑ "The Distribution of Galactic X-Ray Sources from Scorpio to Cygnus". Ap J 150: L75. 1967. doi:10.1086/180097. ↑ Margon B (1984). "Observations of SS 433". Annu. Rev. Astron. Astrophys. 22 (1): 507. doi:10.1146/annurev.aa.22.090184.002451. ↑ "Magnetars". Sci Am: 34–41. 2003. http://solomon.as.utexas.edu/~duncan/sciam.pdf. ↑ "A Giant Flare from a Soft Gamma Repeater in the Andromeda Galaxy, M31". Ap J: 1. 2008. doi:10.1086/587955. ↑ 50.0 50.1 Fotis Gavriil (2008). Powerful Explosions Suggest Neutron Star Missing Link. ↑ Marjorie Gonzalez (2008). Powerful Explosions Suggest Neutron Star Missing Link. ↑ Victoria Kaspi (2008). Powerful Explosions Suggest Neutron Star Missing Link. ↑ A. Giuliani, M. Cardillo, M. Tavani, Y. Fukui, S. Yoshiike, K. Torii, G. Dubner, G. Castelletti, G. Barbiellini, A. Bulgarelli, P. Caraveo, E. Costa, P.W. Cattaneo, A. Chen, T. Contessi, E. Del Monte, I. Donnarumma, Y. Evangelista, M. Feroci, F. Gianotti, F. Lazzarotto, F. Lucarelli, F. Longo, M. Marisaldi, S. Mereghetti, L. Pacciani, A. Pellizzoni, G. Piano, P. Picozza, C. Pittori, G. Pucella, M. Rapisarda, A. Rappoldi, S. Sabatini, P. Soffitta, E. Striani, M. Trifoglio, A. Trois, S. Vercellone, F. Verrecchia, V. Vittorin, S. Colafrancesco, P. Giommi, and G. Bignami (1 December 2011). "Neutral Pion Emission from Accelerated Protons in the Supernova Remnant W44". The Astrophysical Journal Letters 742 (2): L30. doi:10.1088/2041-8205/742/2/L30. http://arxiv.org/pdf/1111.4868. Retrieved 2014-10-02. ↑ R. Shelton and R. Petre (31 October 2000). More Images of Chandra Archive Collection. 60 Garden Street, Cambridge, MA 02138 USA: Harvard-Smithsonian Center for Astrophysics. Retrieved 2016-12-03. ↑ 57.0 57.1 57.2 57.3 57.4 Jennifer Harbaugh (13 March 2015). "Mini Supernova" Explosion Could Have Big Impact. Washinton, DC USA: NASA. Retrieved 2016-10-12. ↑ Chandra X-ray Observatory (20 September 1999). E0102-72. 60 Garden Street, Cambridge, MA 02138 USA: Harvard-Smithsonian Center for Astrophysics. Retrieved 2016-12-05. ↑ C. Canizares and J. Houck (14 January 2000). E0102-72.3: Chandra Finds Oxygen Ring in Ashes of Exploded Star. 60 Garden Street, Cambridge, MA 02138 USA: Harvard-Smithsonian Center for Astrophysics. Retrieved 2016-12-05. ↑ 61.0 61.1 61.2 61.3 61.4 D. Dewey et al. & J. DePasquale (10 December 2000). E0102-72.3: Adding a New Dimension to an Old Explosion. 60 Garden Street, Cambridge, MA 02138 USA: Harvard-Smithsonian Center for Astrophysics. Retrieved 2016-12-05. ↑ 62.0 62.1 62.2 R. Williams & Y.-H. Chu & MCELS coll. (27 July 2002). DEM L316: Supernova Remnants Deconstructed. 60 Garden Street, Cambridge, MA 02138 USA: Harvard-Smithsonian Center for Astrophysics. Retrieved 2016-12-07. ↑ Juergen Kummer (27 June 2006). Geminga. Muehlenstr. 6 87474 Buchenberg Germany: Internetservice Kummer + Oster GbR. Retrieved 2013-05-08. ↑ Neil Gehrels & Wan Chen (1993). "The Geminga supernova as a possible cause of the local interstellar bubble". Nature 361 (6414): 706-7. doi:10.1038/361706a0. http://www.nature.com/nature/journal/v361/n6414/abs/361706a0.html. ↑ The Sun's Exotic Neighborhood. Centauri Dreams. 2008-02-28. ↑ 69.0 69.1 White NE, Giommi P, Heise J, Angelini L, Fantasia S. "RX J0045.4+4154: A Recurrent Supersoft X-ray Transient in M31". The Astrophysical Journal Letters 445: L125. http://lheawww.gsfc.nasa.gov/users/white/wgacat/apjl.html. ↑ 70.0 70.1 70.2 Kahabka P (December 2006). "Supersoft X-ray sources". Adv Space Res. 38 (12): 2836–9. doi:10.1016/j.asr.2005.10.058. http://www.sciencedirect.com/science?_ob=ArticleURL&_udi=B6V3S-4MBT29S-2&_user=10&_origUdi=B6V3S-3YN948T-5&_fmt=high&_coverDate=12%2F31%2F2006&_rdoc=1&_orig=article&_acct=C000050221&_version=1&_urlVersion=0&_userid=10&md5=3a3d0440365be046b322ab561aae9230. ↑ 72.0 72.1 Greiner J (2000). "Catalog of supersoft X-ray sources". New Astron. 5 (3): 137–41. doi:10.1016/S1384-1076(00)00018-X. http://www.mpe.mpg.de/~jcg/sss/ssscat.html. ↑ Catalog of Supersoft X-ray Sources. ↑ E.P.J. van den Heuvel, D. Bhattacharya, K. Nomoto, and S.A. Rappaport (August 1992). "Accreting white dwarf models for CAL 83, CAL 87 and other ultrasoft X-ray sources in the LMC". Astronomy and Astrophysics 262 (1): 97-105. ↑ Roman Tomaschitz (March 2007). "Superluminal cascade spectra of TeV [gamma-ray sources"]. Annals of Physics 322 (3): 677-700. doi:10.1016/j.aop.2006.11.005. http://wallpaintings.at/geminga/superluminal_cascade_spectra_TeV_gamma-ray_sources.pdf. Retrieved 2011-11-24. ↑ 77.0 77.1 S. L. Snowden, R. Egger, D. P. Finkbiner, M. J. Freyberg, and P. P. Plucinsky (1 February 1998). "Progress on Establishing the Spatial Distribution of Material Responsible for the 1/4 keV Soft X-Ray Diffuse Background Local and Halo Components". The Astrophysical Journal 493 (1): 715-29. doi:10.1086/305135. http://iopscience.iop.org/0004-637X/493/2/715/fulltext/. Retrieved 2012-06-14. ↑ Stan Woosley, Thomas Janka (December 2005). "The physics of core-collapse supernovae". Nature Pnysics 1 (3): 147-54. doi:10.1038/nphys172. ↑ Sara Lucatello, Thomas Masseron, Jennifer A. Johnson, Marco Pignatari, and Falk Herwig (1 March 2011). "Fluorine and Sodium in C-rich Low-metallicity Stars". The Astrophysical Journal 729 (1): 40. doi:10.1088/0004-637X/729/1/40. http://iopscience.iop.org/0004-637X/729/1/40. Retrieved 2014-02-08. ↑ C Lunardini, B Müller, HT Janka (2008). "Neutrino oscillation signatures of oxygen-neon-magnesium supernovae". Physical Review D 78 (2): e023016. http://prd.aps.org/abstract/PRD/v78/i2/e023016. Retrieved 2014-02-08. ↑ 81.0 81.1 81.2 T. Hayakawa, K. Nakamura, T. Kajino, S. Chiba1,5, N. Iwamoto1, M. K. Cheoun6, and G. J. Mathews (10 December 2013). "Supernova Neutrino Nucleosynthesis of the Radioactive 92Nb Observed in Primitive Meteorites". The Astrophysical Journal Letters 779 (1): L9. doi:10.1088/2041-8205/779/1/L9. http://iopscience.iop.org/2041-8205/779/1/L9. Retrieved 2014-02-07. ↑ Rosemary Nocera (18 March 2013). TYPE IA SUPERNOVAE. Space Telescope Science Institute (STScI), 3700 San Martin Drive, Baltimore, MD: Hubblesite. Retrieved 2016-12-06. ↑ 83.00 83.01 83.02 83.03 83.04 83.05 83.06 83.07 83.08 83.09 83.10 Nadia Drake (28 August 2014). Type 1a Supernovae: Why Our Standard Candle Isn’t Really Standard. National Geographic. Retrieved 2016-12-06. ↑ 84.0 84.1 Robert Kirshner (28 August 2014). Type 1a Supernovae: Why Our Standard Candle Isn’t Really Standard. National Geographic. Retrieved 2016-12-06. ↑ 85.0 85.1 Ryan Foley (28 August 2014). Type 1a Supernovae: Why Our Standard Candle Isn’t Really Standard. National Geographic. Retrieved 2016-12-06. ↑ Brad Tucker (28 August 2014). Type 1a Supernovae: Why Our Standard Candle Isn’t Really Standard. National Geographic. Retrieved 2016-12-06. ↑ M. Lassaut, H. Flocard, P. Bonche, P. H. Heenen, and E. Suraud (September 1987). "Equation of state of hot dense matter". Astronomy and Astrophysics 183 (1): L3-6. This page was last edited on 21 February 2019, at 21:08.